Assessment is the process of gathering, analysing and interpreting quality information about student learning. It is a purposeful, systematic and ongoing collection of information appropriate to the age and development of the students. Assessment is also demonstrably fair, valid, comprehensive, explicit and educative. Three types of assessment practices are used at Ainslie School for diagnostic, summative and formative assessment purposes. Ainslie School builds productive partnerships with families to broaden home/school links that will enable parents to further assist with their child's learning. 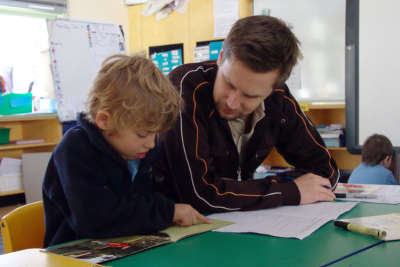 Assessment as learning occurs when students are their own assessors. Students monitor their own learning, ask questions and use a range of strategies to decide what they know and can do, and how to use assessment for new learning. Assessment for learning involves teachers using evidence about students' knowledge, understanding and skills to inform their teaching. Sometimes referred to as 'formative assessment', it usually occurs throughout the teaching and learning process to clarify student learning and understanding. Assessment of learning assists teachers in using evidence of student learning to assess achievement against outcomes and standards. Sometimes referred to as 'summative assessment', it usually occurs at defined key points during a unit of work or at the end of a unit, term or semester, and may be used to rank or grade students. The effectiveness of assessment of learning for grading or ranking depends on the validity and reliability of activities. Its effectiveness as an opportunity for learning depends on the nature and quality of the feedback.